When it comes to frugal recipes, you can’t get more frugal than cooking beans and rice. In fact, it’s a diet staple for millions around the world. I like it for several reasons: first, the next to nothing cost, that I can keep the ingredients on hand in the pantry, the ease of preparation and finally, because beans and rice are just so darned delicious! Not only all that, but I know my kids will it this and it freezes well. It really is the perrfect dish. This is one of my favorite go to recipes when I can’t think of anything more adventurous, or when the larder is looking a little bare. You do have to soak the beans overnight, so it requires a little prep time, but once you start cooking this dish you can pretty much ignore it. I use one and a half cups of dried beans and two cups of rice to feed five, with a little left over. Soak the beans overnight, or at least twelve hours. Drain and rinse well. Put in a large pot and add enough water to cover twice over. I like to throw in a bouillon cube too. 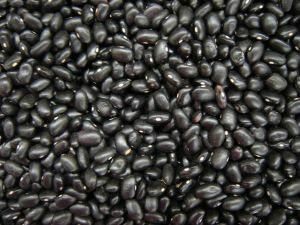 Cook for at least 45 minutes; the beans will not be thoroughly cooked, but you will be able to chew them. Add the rice. You can add a chopped onion or tomato at this point too. Cover and cook until all the water is absorbed and the beans and rice are soft, about another 20 to 25 minutes. Serve with a dollop of sour cream and a spoonful of salsa. Yum! Thanks for pointing me to this. We’re doing the rice & beans thing alot lately. If you get a chance, go to my blog, frugal recipes, and try mujudarrah. Rice & lentils. Divine with a salad dressed with lemon juice & olive oil.